Last weekend my little brother and I were chilling at home together. We had watched a few episodes of some of our favorite shows on Netflix. We did some decorating for Halloween. The mantle and fireplace in the living room look awesome right now. Anyway, we decided we deserved a treat and decided to whip up these cookies. 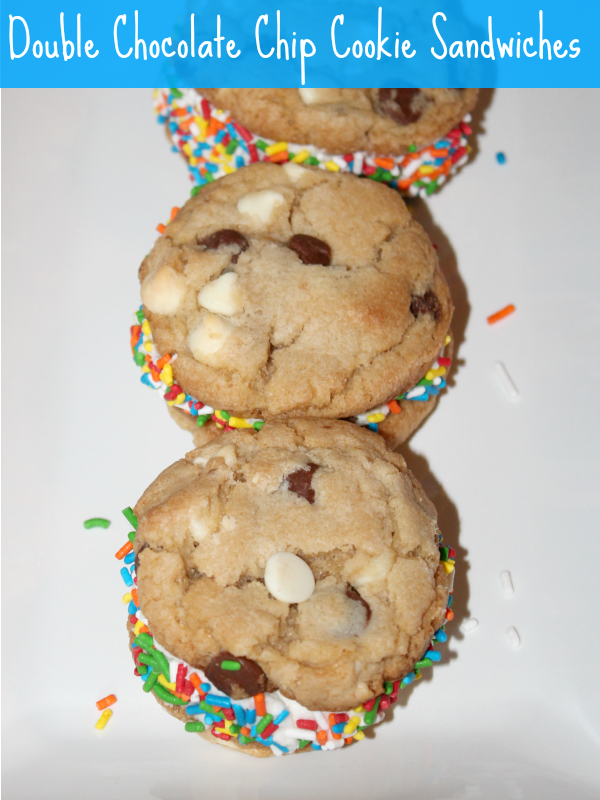 Initially I was going to make white chocolate chip cookies because I am in love with white chocolate chips. When it came time to add the chips though my brother was like, "Wait, we have to use milk chocolate chips." So we compromised and added some of both. These cookies are so yummy because they are thick and chewy. Have you ever had the double doozie cookies from The Great American Cookie? 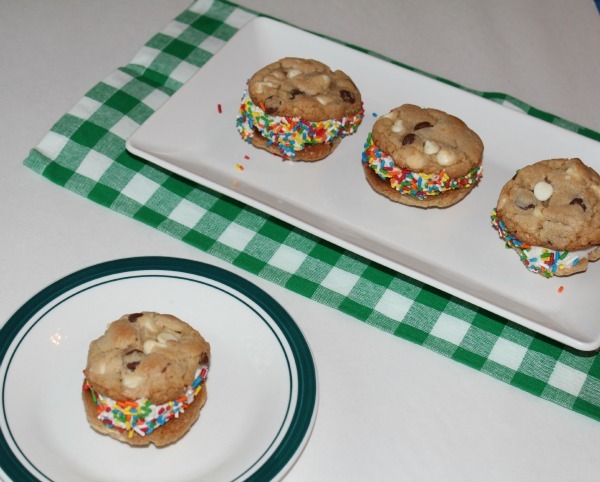 You know the cookie sandwiches with the very sweet frosting in the middle? While waiting on the cookies to cool, well ok, we didn't exactly wait. While munching on a warm cookie my brother said he wished that they were like the double doozies. So then we whipped up this frosting while the cookies cooled and made sandwiches. Trust me they are delicious! 1. In a bowl sift the flour, cake mix, and baking soda together. Set this bowl aside. You will have extra cake mix from the box. You could save the remainder in a zip lock bag to make a second batch. 2. In a large bowl cream the butter and both sugars together until smooth. Then add in the egg and vanilla and mix until incorporated. Now mix in the flour mixture. 3. It's break time. Set this cookie dough in the fridge to chill for 2 hours. 4. Preheat the oven to 350 and line your cookie sheets with parchment paper. I used a medium cookie scoop to evenly measure out my dough. I think its around a tablespoon and half of dough per cookie. When rolling out the cookies you want them to be taller than they are wide, so that they will bake to be thick, chewy cookies. 5. Bake a pan of cookies for 10-12 minutes, until the edges are brown. When you pull them out of the oven you will question if they are done in the middle or not. Leave them on the pan for 4 more minutes to continue baking. Then move them to a wire rack to cool. They will be done and they will be delicious. 6. Cream the butter and shortening together well. Then add the powdered sugar and vanilla. Mix thoroughly. 7. If the frosting is too thick add a teaspoon of milk. Then mix. If it is still too thick add milk at a half a teaspoon at a time until you reach the desired consistency. I had to add a teaspoon to mine and then it was the way I like it. At any point if you have added too much milk and it is too think add a little powdered sugar to thicken it up. 8. 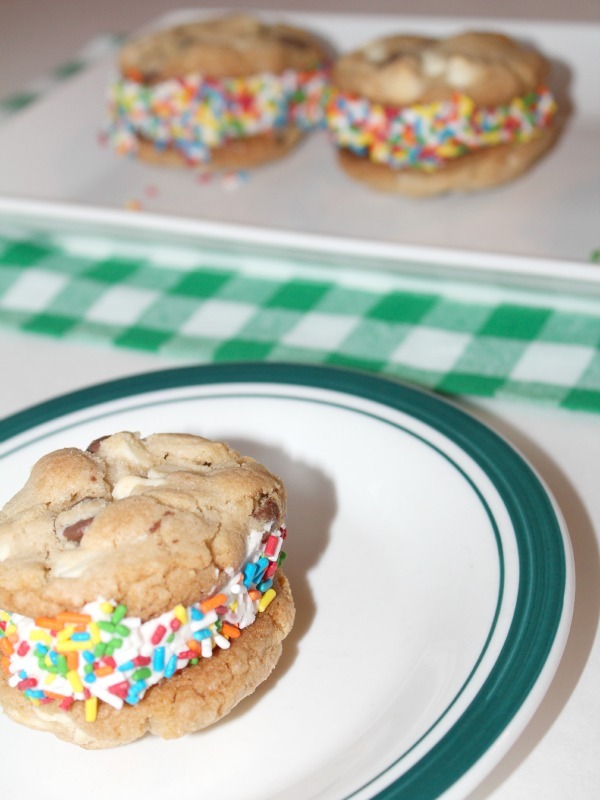 Once the frosting is made and the cookies have completely cooled they are ready for you to make your sandwiches. I took a cookie and added about 2 teaspoons of frosting and then topped it with a cookie to make my sandwich. 9. Optional: Once you have made your sandwiches you can take a plate and pour some sprinkles in it. Then roll the edge of your sandwiches around the plate to decorate them with sprinkles. I think this turned out very pretty. Yum, the frosting sounds amazing. I actually woke up this morning craving a piece of cake.